View Parents enables you to see at a glance, a list of parents and all associated students (as per your MIS data). You will also find this feature useful if you need to provide individual parents with a payment URL or to view their transaction history. 1) Open Messenger Payments from your Tiles (Homepage), if you aren’t already within Messenger Payments. 2) To access View Parents, select the option from the Menu at the top of the page. 1) From the top of the list of Parents, you can use the search bar to locate individual parents. Just type in at least first three letters of a parent’s surname and click Find. 2) To remove the search filter, click Actions from the top right corner and select Reset search. 1) You can also re-order the list of parents by alphabetical order by click on the Parent name header at the top of the first column. 1) Once you have located the parent you need to view, click on their name from the first column (Parent name). a. View Parent URLs: view previously issued URLs that parents need to make a payment for an activity. b. View Activities: view list of all activities. c. View Transactions: view payments this parent has previously made for activities. d. View Lunch Transactions: view payments this parent has previously made for lunch. 1) From the View Parent Details page, click View Parent URLs from the bottom left. 2) The page will display a list of URLs for activities that still need to be paid for. a. If an activity has already happened, but was not paid for by this parent, it will still appear on this page in red. 3) Clicking on any of the URLs will open the payment page for parents to select the activities they want to pay for. a. To share a URL with the parent, just right-click it from the first column to copy it. a. Parents will have three attempts to enter the correct details for their child. For more information on how parents access their Messenger Payments portal, click here. Top Tip: Parent will have been sent the payment URL via email/SMS when the activity was initially sent to them. Sending them a reminder will also provide them with the URL to pay for the activity. 1) Click View Activities for the parent that you are viewing. 2) The Activity History will display a list of activities assigned to the student(s) that this parent is linked to. 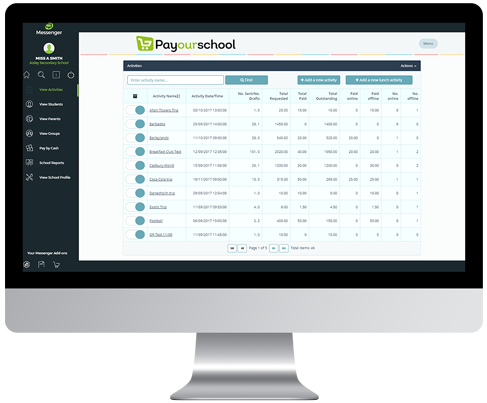 3) For each activity, you will see the payment required, whether it has been paid or settled, the option to send a reminder and to remove the student from an activity altogether. If a parent has yet to pay for an activity (identifiable if there is an Outstanding Balance), you can click on the icon under the Reminder column to send an email/SMS to nudge the parent. To write off a payment for a student for any of the listed activities that still have an Outstanding Balance, click the icon under the Settled? column. This will remove the payment required from this parent. Click on the icon next to an activity/student on the list to add any important notes and to send a reminder. Click on the icon next to an activity/student if you wish to remove the student from the activity. Click on from the bottom of the page to download a .csv listing the activities assigned to this parent’s linked children. Ensure that you have enabled downloads in your internet browser. 1) Click View Transactions from the View Details page of the selected parent. 2) The Transaction History page will display a list of all payments made by this parent. 3) Click from the bottom of the list to download the list of activities as a .csv. Ensure that you have enabled downloads in your internet browser. 1) Click View Lunch Transactions from the parent that you are viewing. 2) Whereas the previous section (View Transactions) will display all payments a parent has made, View Lunch Transactions will just display payments made for lunch activities (cashless catering). 3) To export the list of payments, click from the bottom right of the page.